My first year of college was the first year that Facebook expanded beyond Ivy League schools and was open to anyone with a .edu email. The promise was that you could sit in your dorm room and not talk to anyone but still be socially connected. The reality turned out to be a little different. Kate and I realized that in order to connect with our new neighbors along 7th Ave we would need to turn off our computers and step outside. The nerves began fluttering as soon as the first invitations came out of the printer. The first knock was the hardest; but once we got started it was pretty easy and fun to meet our neighbors (especially when you’re not selling anything). The invite. In my next post I’ll share how it went. 1. 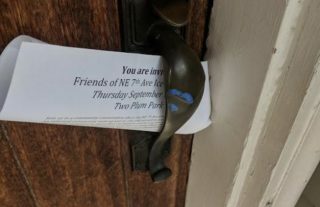 Knock on every door (unless there is a no solicitation sign, in which case just leave the flyer under the mat). 2. If we don’t hear anything or if no one answers in 10 seconds, just leave a flyer. 3. Introduce ourselves, but don’t give our opinions about the project unless asked. If we did share our opinion, we’d also share the other side. We spent about 1-2 hours over three days (less time then I waste on the internet) knocking on doors. We tried to go from between 4-6:00 pm to maximize the chances that someone would be there and not be eating dinner. Out of 200 doors, 20% led to people talking with us. 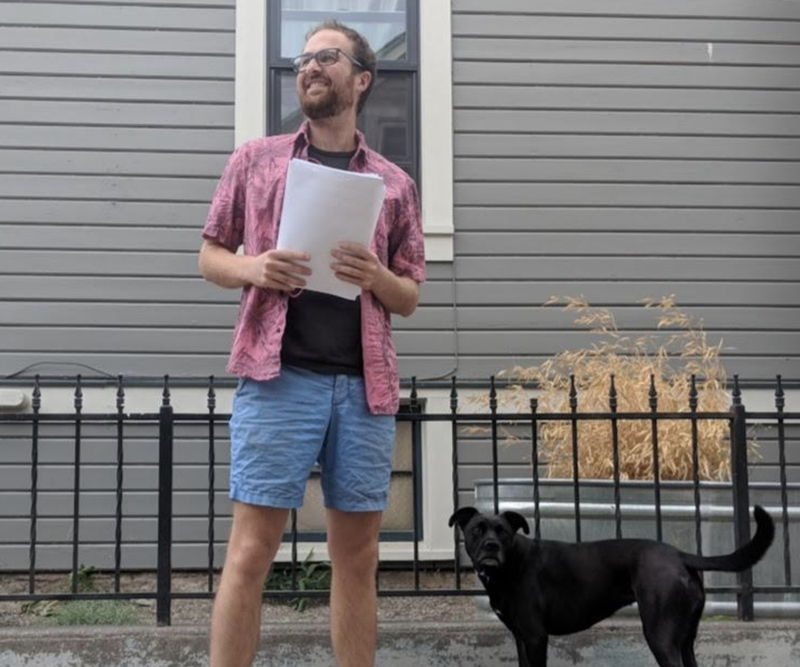 Our script went something like this: “Hello, we’re Kiel and Kate and we live down the street. 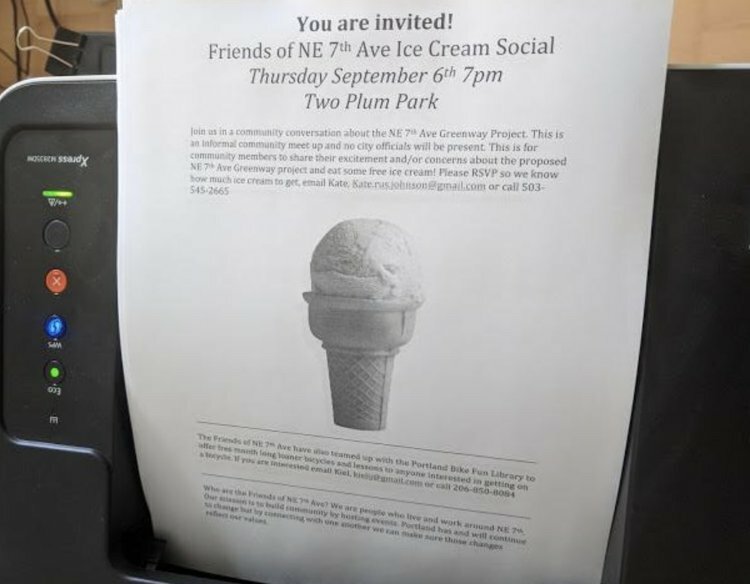 We’re inviting people to an ice cream social to talk about the proposed 7th Ave Greenway.” If they looked puzzled I’d ask if they’d heard of the project (most people had) and then I’d say that I don’t work for the city but if they had any questions I’d try to answer them. 100% of the people who gave me their opinion about the project — which was almost everyone I talked to — were in favor of it. After three days of handing out flyers I really had no idea if anyone would show up to our ice cream social. If someone had knocked on my door inviting me to an ice cream social I probably wouldn’t go. One of the most important lessons I’ve learned so far is the value of putting a human face on a project who does not work for the city. In my next post I’ll share what happened at the ice cream social: Will anyone show up or will we run out of ice cream? I love the sentiment here and fully support the innovative community building effort, but I have one small quibble with your second to last sentence. If you were hoping to hang a portrait on the Rose Quarter highway expansion, that sentence would serve you well. When used in this article, however, this sentence implies that you do not think that this project works for the city. Maybe this in intentional, but I advise you to tweak that sentence otherwise. What I mean is that, in my experience people have a better reaction when they are hearing about a project when it is coming from someone who does not work at the city. If the only person they have interacted is from the city, in my experience, they are more likely to have a negative reaction. When they interact with a neighbor or someone from their community I think they are more likely to be open to change. I would love to see PBOT build up more of a volunteer group of people who do not work for PBOT who can go out and talk to people about a proposal. Oh, I totally understood that intention. I completely agree with the sentiment. I was just trying to find a clever/polite way to say that you needed to tweak that sentence, which I can see you’ve now done! It makes more intuitive sense now that you’ve replaced ‘that doesn’t work’ with ‘who doesn’t work’. I didn’t mean to derail the comments into a discussion of syntax and semantics, so I apologize for having done that. As you can see, I also made a typo in the last sentence of my comment. I just think your message is so good that it deserves amplification, but when one amplifies something that hasn’t been properly clarified, distortion results. Now that the language has been refined we can shift all discussion to the excellent ideas present in this article. How about “One of the most important lessons I’ve learned so far is the value of putting a human face on a city-lead initiative that may or may not work for the community.” ? I bet he meant “… putting a face of someone who doesn’t work for the city …”. 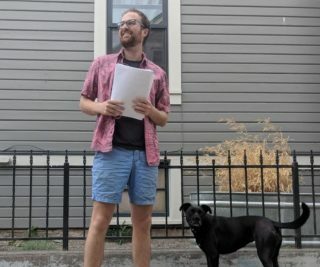 A 20% response rate is extraordinarily good for a city as big as Portland. For the community members in the HUD project and some of the 80% you weren’t able to connect with, you might try connecting through some of the local black churches. Even when people are not particularly religious, the local churches provide a local community support and organizing function for many visible minority groups; they also tend to stick around long after their members have left the area due to high rents and involuntary economic displacement. Contact the churches during business hours. I agree that 20% is awesome, especially in such a short run. 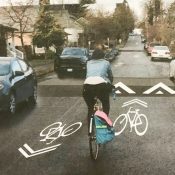 I once did a four-block length of street for a similar project (removing on-street parking on one side to get the bike lanes out of the door zone) and after ten trips only got a third of the 150 doors to answer. 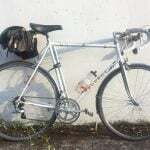 I did learn that every single one of the residents who rode bikes had been doored on that street and that over 20% of the residents used bikes as their primary while “only” 45% used cars. I was really impressed by that ratio too! I’m enjoying this series and of course grateful for Kate and Kiel’s tireless work to improve our streets. This is what the city/country/world needs. I read that as humanizing a project that does not work. I see what you mean, though. Maybe try: I have learned the value of a community member, instead of a City employee, discussing a project. Thanks for all your hard work, Kiel and Kate! Love the earnest, friendly, open-minded approach. Folks, this is a really good way to make things happen.